Some exciting talk has circulated in recent weeks about a new U.S. Fish & Wildlife Service report that finds hunting participation increased across the U.S. during the past five years. The agency released its preliminary National Survey of Fishing, Hunting and Wildlife-Associated Recreation in August. The survey is conducted every five years and often is the basis for conversation by policy makers about the economic impact of hunting, fishing or wildlife viewing. The August report said, “Hunting participation increased 9 percent from 2006 to 2011” in the U.S. Among the survey’s many findings was that in 2011 “13.7 million people, 6 percent of the U.S. population 16 years old and older, went hunting. Hunters in the U.S. spent an average of 21 days pursuing wild game. That’s a lot of money. And you could almost hear hunters, wildlife biologists, and ammunition manufacturers cheering in the woods. One can only imagine the hissing at coffee houses where anti-hunting factions might gather. Hunting, as an institution, has been reported to be in decline for some time. That decline has made many panic. License sales translate into funding for state wildlife programs. Guns, ammo and camouflage manufacturers thrive when license sales are up. Unfortunately, some have taken this most recent national uptick as gospel for Michigan too. But doing so is jumping the gun. Hunting participation continues to decline in Michigan, not as much as the 2011 and 2006 reports suggest, but the trend is downward nonetheless. conducts research about hunting participation. Frawley’s numbers are based on actual license sales. FWS numbers are based on contacts with “a few hundred households in the state,” then statistically extrapolated, Frawley said. The result is that FWS underestimated the number of Michigan hunters by 30 percent, Frawley said. The 2011 preliminary FWS state report shows Michigan as having only 529,000 resident and nonresident hunters. Numbers, of course, can be dizzying. Frawley said there is little to no margin of error in Michigan’s calculations. 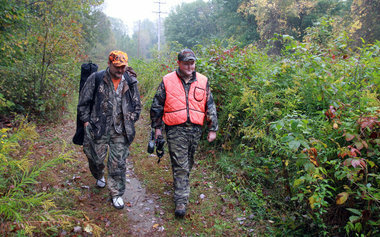 Michigan has to certify how many hunters it has to qualify for federal Pittman Robertson money. Those are funds from federal excise taxes on guns and ammo that get returned to the state each year for wildlife and game management based on the number of licensed hunters. Certification requires having the names and addresses for each license buyer. But even the FWS numbers show a decline in Michigan. The 2006 FWS report lists Michigan having 753,000 hunters. That drops to 529,000 in 2011, much more than actually occurred. “Michigan is normally in the top five states for hunters, but, according to the 2011 report, we didn’t even make the top 10,” Frawley said. What this means for hunters who look at the report is that some of the FWS data is not accurate. Frawley suggests even the 9 percent national increase might turn out not to be that high. And the basis for those numbers also might prove to be more the result of an accounting change than a change in practice on the ground. What that means is the same number of people actually hunts today, but what is reported now is higher than it was in those states. What is unfortunate is that these discrepancies cast a shadow on the veracity of the 2011 FWS report. If the number participating is wrong, so, too, are the economic figures. The numbers are important to Michigan and other states. They provide a snapshot of real economic potential. That has implications for public land managers, businesses and communities who benefit from the nearby recreation. The FWS survey long has been the Bible for fisheries and wildlife recreation economic data. The agency ought to be able to do better. And if it can’t, well, that would be something to get really excited about. 2012 MLive.com. All rights reserved. This entry was posted in Uncategorized and tagged DNR, Fishing, Hunting, Michigan Department of Natural Resources, Pittman Robertson, U.S. Fish & Wildlife Service, Wildlife. Bookmark the permalink.